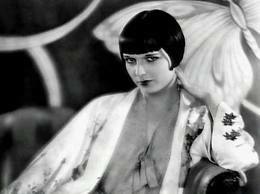 Louise Brooks in "Pandora's Box"
A fifth of the way there! I’m counting down the days til the end of the month when I’ll officially be a quarter of the way done! But in the meantime, I’ll continue to shelp my way thru these silent movies. One plus that I’ve found is that you can mute the “soundtrack” and open up a music app on your computer and listen to something a bit more modern. Say, something with drums or perhaps a guitar. Onward now to The Dawn Patrol and the 1930’s! I love Howard Hawks movies! Maybe I’ll watch tomorrow’s with the sound actually on! Tags: 100 Years in 100 Days, Derrick Deane, Eddie Money, Howard Hawks. Bookmark the permalink.